Reading group, farm plays, and a visiting poet, oh my! This is the month, y’all. 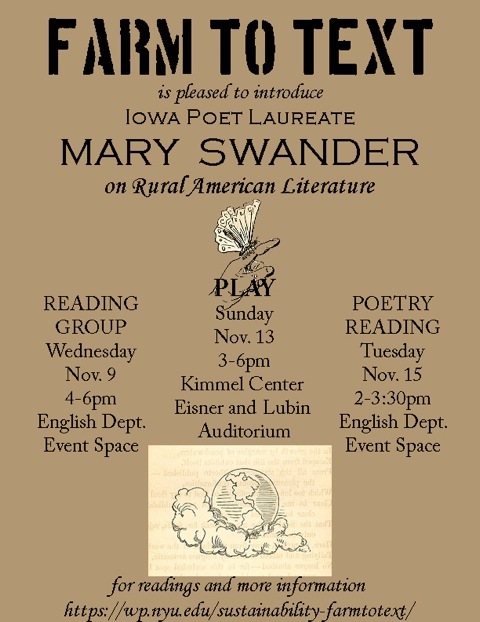 The Poet Laureate of Iowa is coming to NYU and we want to show her a good time. First, we’re meeting NEXT WEDNESDAY, Nov 9, at 4:00 in the Event Space, in advance of Mary’s visit, to read and discuss her one-act play Farmscape, which has toured all over the US, including a performance for Tom Vilsack of the USDA. 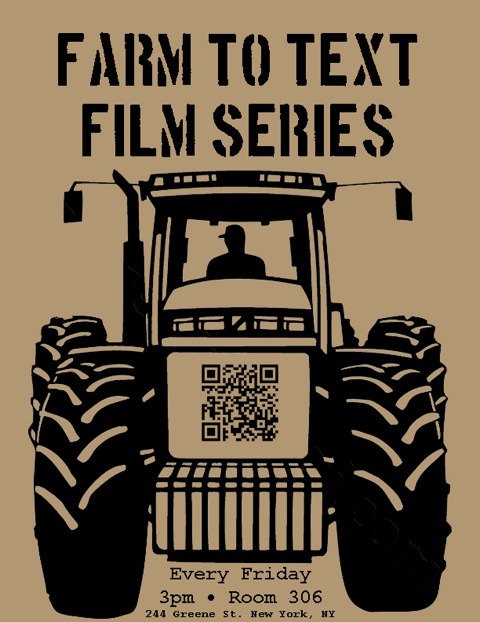 Farmscape documents the struggles and joys of the modern farmer trying to get by in this country’s midwestern heartland and is based on documentary interviews with Iowan farmers. Mary has toured the play especially in many small towns across the Midwest, where she often has local community members learn and act out the parts of the various characters, taking the concept of “community theater” to a different level. I once saw it performed in a rickety hundred-year-old church house at a crossroads town in the Iowan countryside. It’s quite an interesting read. We have ten copies of the play available. I’m going to bring the box of them into the mail room tomorrow. It’s not a long play and should be a quick read, and the book version also comes with a host of interesting essays about contemporary rural issues, from sustainable agriculturists to rural sociologists. We’re providing these at no cost to you. If we run out of copies and you’d still like to read it, let me know and I’ll see what we can do. We’ll have our usual munchies and whiskey at the reading group meeting. Second, Mary is coming to New York for a staging of two of her more recent one-act farm plays, Vang and Map of My Kingdom, or Who’s Going to Get the Farm?, on the topics, respectively, of recent immigrant farmers and farmland transfer (what happens to farmland kept in a family for generations, including the drama around new generations that aren’t interested anymore – implying the struggle between big and small ag, corporate vs family ownership – etc). This will take place on Sunday, Nov 13, at 3:00 in the Kimmel Center, Eisner and Lubin Auditorium (a block west of Bobst) and is free with your NYU ID. The event will feature both plays, followed by a talk-back with Mary. I’m attaching the program here. Third, Mary has agreed to give a reading and Q&A on Tuesday, Nov 15, at 2:00 in the English Department Event Space. This should be a lot of fun — Mary is very personable and engaging on stage. We’ll have some munchies. I really hope you can join us for some or all of these great events. Please feel free to pass this information on to whatever friends and colleagues might be interested. Swander, Mary. Farmscape (play). North Liberty, IA: Ice Cube P, 2012. Print. We have a number of copies available for Reading Group participants, which will be available in the English Department mail room. 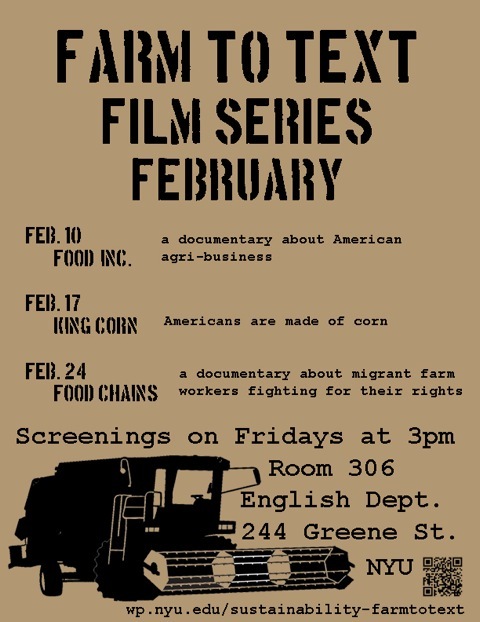 If we run out and you’d still like to read it, contact John at farmtotext@gmail.com. Chesnutt, Charles. The Conjure Stories, three stories. Ed. Robert B. Stepto and Jennifer Rae Greeson. New York: Norton, 2012. Print. Reddy, Chandan. “Modern.” Keywords for American Cultural Studies. Ed. Bruce Burgett and Glenn Hendler. New York: NYU P, 2007. Print.